There is no argument that the introduction of home video gaming consoles had a major damaging impact on arcades, as people stayed home to play video games rather than spend time and money to play them in gamerooms. Video game play has now expanded from televisions screens to every type of screen, including computers and mobile devices (predominately smartphones). Today, half (51%) of U.S. households own a dedicated game console and those that do own an average of two. 59% of Americans play video games, and among those that do, over half (53%) play games on a smartphone. Participation in video games is big time. In addition to taking business away from arcades, the time people spend playing video games takes away from their leisure disposable time, roughly five hours a day on average, that they can use to visit a location-based entertainment (LBE) venue. It’s a plain and simple competition in a zero sum game for their leisure time, and of course, their disposable income. Well, if video game play wasn’t bad enough competition for LBEs, now it has become a major online, spectator, competitive sport known as eSports. Last year 71 million people watched other people play video games, almost half (31.4M) in the United States. One in five American video gamers now either watches or participates in eSports. The average eSports viewer watches 19 times a month for 2.2 hours each session. 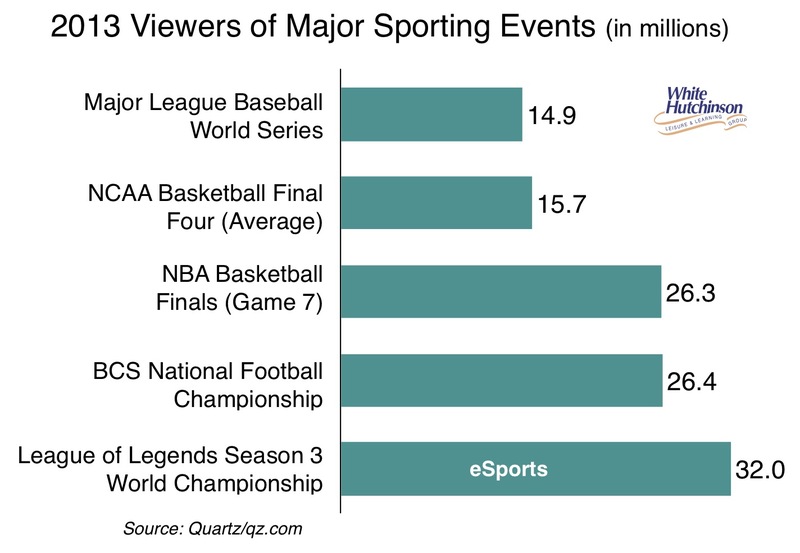 eSports viewership is doubling each year. Now there is even a dedicated website, Twitch.tv, dedicated to watching people play video games. The two-year-old website sends streams from more than 600,000 video game playing broadcasters each month to over 45 unique viewers. eSports have become so popular, that both Sony and Microsoft have now integrated Twitch and other streaming technology into their videogame consoles. YouTube has a popular channel, PewDiePie, devoted to videogame content that has more than 16 million subscribers. Another popular, recently launched online broadcast network for eSports is premium MLG.tv for professional level competitive gaming, operated by Major League Gaming. Last October more than 32 million people tuned into the Twitch live stream of the Season 3 world championship broadcast of the Riot Games’ League of Legends, more than the combined total that watched the series finales of the television shows Breaking Bad, 24 and The Sopranos. League of Legends is the world’s most popular eSports game, but in the Western World, Call of Duty is the most popular. To see a one-minute trailer for the upcoming 2014 Call of Duty Championship with a $1.0 million prize pool, click here (mature 17+). ESPN has now recognized eSports as being an official ‘sport’ alongside other sports, which until now have all involved real world physical play. ESPN and Major League Gaming have agreed for the first time in history that MLG pros will compete at ESPN’s X-Games for a shot to take home a medal. This will bring the first-ever Major League Gaming X Games Invitational to the inaugural X Games Austin in June. Eight of the world’s best Call of Duty teams will compete in a three-day tournament for a shot at a medal. MLG will have a dedicated area showcasing the event at X Games Austin. The gaming tournament will be featured next to other X Games events in fields like BMX, Moto X, and skateboarding. It’s unclear how much of the ESPN/ABC X Games TV broadcasts will focus on gaming, but MLG says highlights of the tournament will air on both networks. The complete tournament will air exclusively on MLG.tv channels on the web, mobile apps, and the MLG app for Xbox 360. If you think about it, this is a significant milestone in the expansion of the digital world into our leisure lives. Now playing eSports, where the competition really takes place in the virtual world, is considered a legitimate sport. And for the first time in the history of mankind, all the participating sports players don’t have to be located at the same physical place. As if eSports play and its viewership hasn’t made the entertainment competitive landscape worse enough for LBEs, now eSports is raising the bar by competing for a share of what time people do spend out of their homes at entertainment venues. Now eSports is taking place in stadiums and arenas. Last Fall the Staples Center in Los Angeles sold out of its 18,000 tickets to watch the League of Legends Season 3 World Championship. But that one time event is small time compared to what is about to happen, and unlike a lot of remarkable new venues, it won’t be in Dubai, but rather in China. Hengqin Island located off the coast Macau, where millions already come to casinos to play games of chance, is where gamers will be coming to watch other gamers play Xbox in the competitive-gaming industry’s first own ‘Madison Square Garden,’ a new eSport 15,000 spectator capacity MLG Gaming Arena in a new $2.8 billion V-Zone gaming theme park. The first phase of the park with the arena is expected to cost $480 million and is slated for completion in 2017. V-Zone is the planned centerpiece of the $18 billion Creative Culture City. 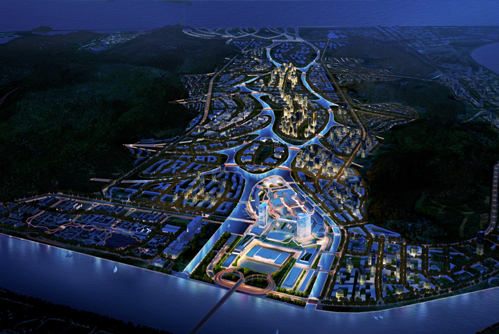 The Hengqin Creative Culture City will be the 1st development in China and in the world to house a permanent visitor attraction dedicated to video game and eSports activity. In addition to being the site of the world’s first MLG Gaming Arena, the V-Zone is slated to include an expo area for game developers to feature new and upcoming games, creative workspaces, gaming-themed restaurants, retail shops and more. The growth of eSports and its introduction into different real world venues is only in its early stages. We’re sure to see it become an even more significant option for a growing segment of the population as a form of entertainment and/or sports. This entry was posted in digital, eSports, Leisure time, video games and tagged arcades, arena, ESPN, eSports, gaming arena, MLG, play, sports, Twitch.tv, V-Zone, video games, X Games. Bookmark the permalink.